PAC611HFM, STC-Shaped Guitar from Yamaha in the Pacifica series. Pacifica — a name that recalls the beach, the ocean, the sun. If you like sailing, following the wind for hours armed only with your courage and a fishing-rod, you'll be disappointed by the present review: this is not a hunting/fishing magazine! 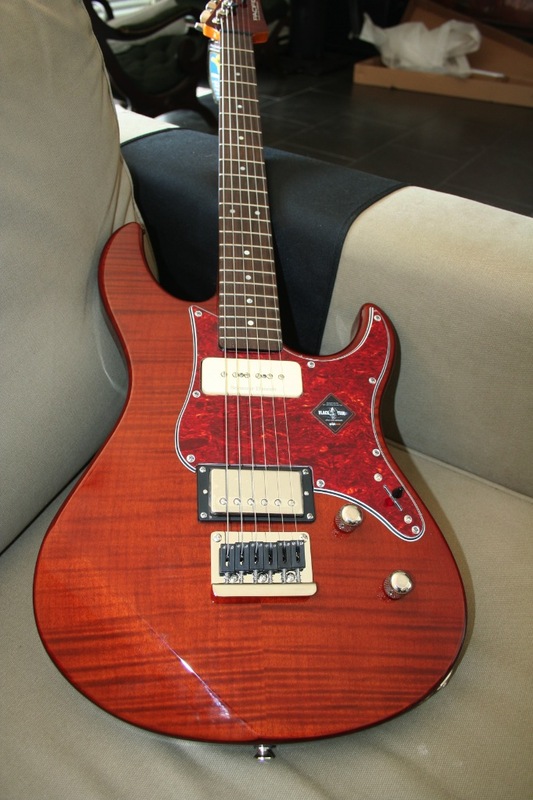 We review today a guitar designed by Yamaha Guitar Development Hollywood that has been on the market since 1990. It's been 22 since the first Pacifica came to the world and I look forward to discovering the features of the new generation. It's my ocean quest! As soon as I arrived at AudioFanzine's editorial island they gave me the instrument and I was surprised to discover that it comes inside a wonderful cardboard gigbag with Yamaha printed on it. Warning! This biodegradable protection bag will disappear with the first showers. So, I take it out of its eco-bag and discover the nice "Root Beer" (as in the plant-extract-based frizzy drink some people love to drink) finish. The translucent varnish lets you see the flamed maple top set on the alder body. The bolt-on maple neck has a glossy honey finish. The matching headstock gives a vintage feel to the guitar. The rosewood fingerboard has a 335mm radius and 22 frets. The tortoise pickguard matches the color of the guitar perfectly. It all looks really good! When it comes to features, Yamaha's designers stroke a decisive blow. The headstock is equipped with locking Grover tuners and a Teflon nut ensuring reliable tuning stability and a longer lifespan for strings. For strong people, Yamaha's team didn't forget to exchange the standard bridge saddles with Graph Tech (Teflon) saddles. Also notice the through-body strings for better sustain. Strat-type guitars have got us used to many different pickup combinations: SSS, HSS, HSH, etc. (H = Humbucker, S = Single coil). 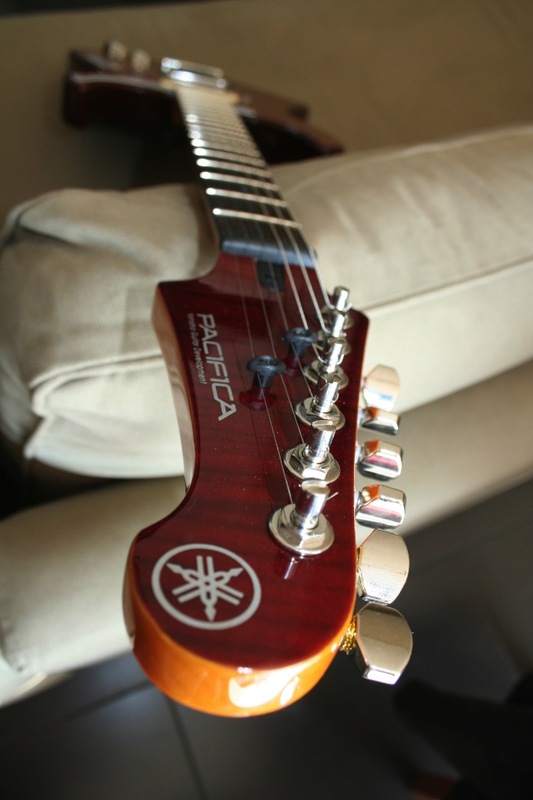 This Pacifica offers a new combination including a P90 pickup on the neck position and a humbucker on the bridge. Let me introduce you to them. The P90 (no, it's not a gun) is actually a Seymour Duncan SP90, described as the faithful reproduction of the first soap-bars with a fat sound and a high output level. 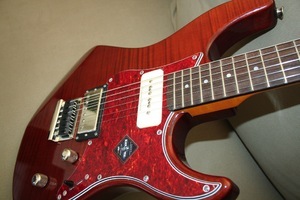 The other pickup is an S.D.Custom 5 (the number describes the magnet type: Alnico V). In fact, it's a custom "Classic 59's" for a more vintage sound with less distortion. The outfit looks great, but how does it look inside? The rear plate is held with three screws. The wiring is reasonably clean (they forgot to use cable clamps). The quality of the potentiometers is not the highest but we appreciate the fact that Yamaha chose a polypropylene capacitor instead of a standard ceramic one. Now that we know each other better, it's time to play with the siren from the Pacific. In spite of the maple top, the weight of the instrument is reasonable (about 6.5 lb.). 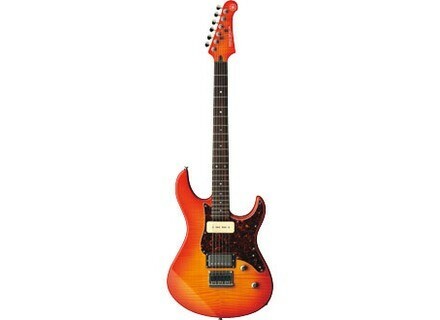 Both when sitting down and standing up, the shape of the guitar matches your body, which makes it very pleasant to play. I don't like varnished necks, so I began with some sort of a handicap, but I swore to stay objective for the review! And it was a wise decision: this neck is thin, feels pleasant and is as fast as they come. The hand slides effortlessly along the full length. I started by playing "Wonderwall". 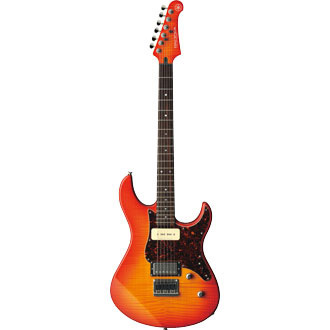 The guitar emphasizes high-mid frequencies, which is not surprising for an alder/maple combination. 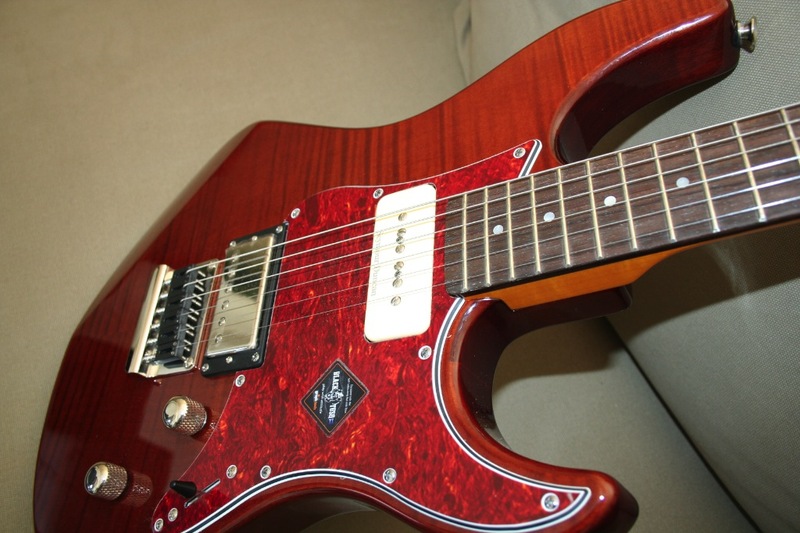 Luckily, the rosewood fingerboard brings a bit of softness to this bright sound. Played unplugged, the guitar produces a dynamic sound with enough resonance. All overtones sound good, the factory setting and the action are good. It's time to plug it in to see if it sounds as well electrified as unplugged. I power on my everlasting JTM45 (I won't ever change my ways!) feeding a 2x12" Greenback speaker cabinet and placed a PG57 microphone in front of it. The sound and dynamics I heard unplugged are definitely there. Both pickups reproduced pretty well the nuances of my playing. The midrange is emphasized, which is something you'll either like or not at all. If you're looking for a modern sound, don't even bother looking this direction because this beauty is made for vintage blues/rock. By boosting the gain of the amp I could play "Cocaine" and "Paint it Black". 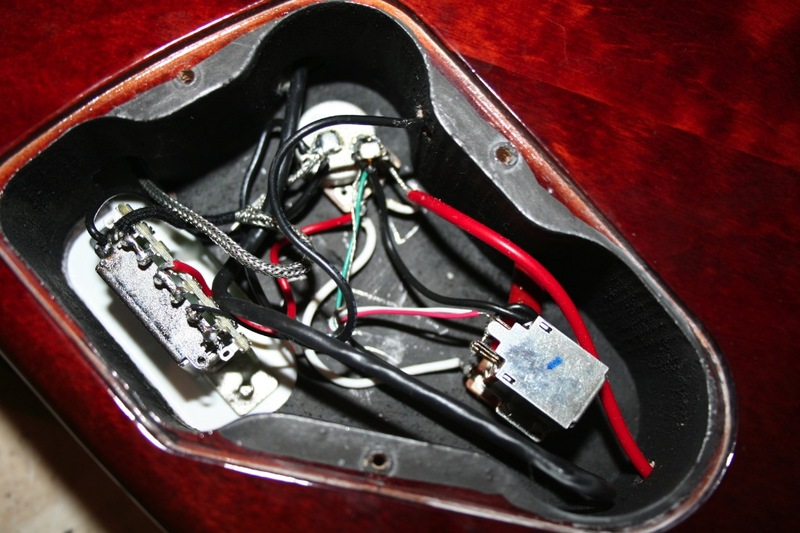 The tone control is a push-pull pot allowing you to split the humbucker and get the bright sound of a single coil. I also plugged the guitar to a Mesa Boogie F50 (2-channel tube amp) to see how it deals with modern amps... and it passed the test successfully! With the clean channel, the P90 produces a quite warm sound. With a little bit of reverb, this sound is perfect for Clapton-style arpeggios. With the drive channel, I like the biting tone of the bridge pickup. The coil-split function is very useful because the Custom 5 emphasizes low frequencies. You can use the push-pull to switch between rhythm and lead sound: the tone becomes warmer and slightly louder. Both plugged and unplugged, it was a real pleasure to play this guitar. The thin neck and the simple controls make it easily accessible. This Pacifica PAC611HFM is a good surprise for the beginning of 2012. 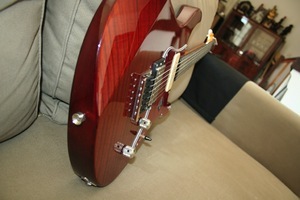 Its versatility will allow you to play anything from ballads to hard rock, blues, Californian, ska, and much more. Unfortunately for fans of heavy metal, fat distortion and modern sounds, this guitar is not for you. Like every other good thing, quality has a price, and the beauty is not cheap. As a consequence, we would like to get a real gigbag with it.